Tourism Minister says response to Givat Assaf terror attack should be legislation normalizing unrecognized villages in Judea and Samaria. 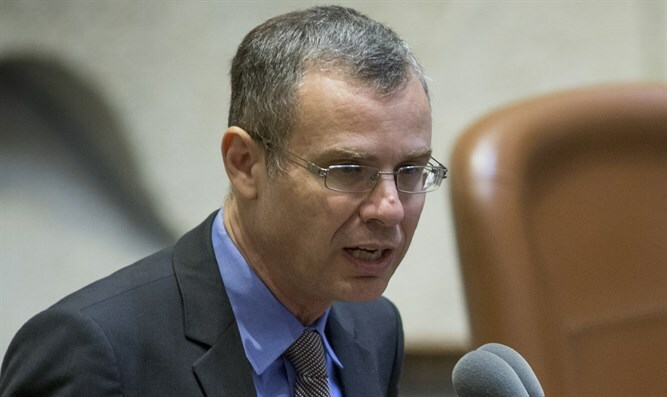 Tourism Minister Yariv Levin called on the government to respond to Thursday's bloody terror attack in Givat Assaf by pushing forward legislation that would regulate hundred of homes in Judea and Samaria. Levin said that he would start pushing forward a bill that would give non-recognized Jewish outposts the same rights as legal villages, such as water and electricity. "The residents of the communities in the planning stages are entitled to all municipal services, just like any other citizen in Israel - including connection to water and electricity infrastructure, budgets and anything needed to live a normal life," said Levin. Levin added that "our response to the murderous terrorism must be clear and sharp. We will continue to persecute the despicable terrorists everywhere and at any time, while at the same time working to continue construction throughout Israel." Levin's remarks came after two Israelis were killed after two terrorists opened fire on them next to the village of Givat Assaf near Bet El. Initial investigations found that a terrorist drove up to the Givat Assaf Interchange, got out of the vehicle and approached the hitchhiking station before pumping at least 15 bullets into the soldiers and civilians assembled there. The terrorist then fled the scene and abandoned his car near Ramallah. Multiple politicians have called to respond to the recent upsurge of terrorism in Judea and Samaria by legalizing disputed homes that remain in legal limbo. Earlier this week, Justice Minister Ayelet Shaked urged Prime Minister Binyamin Netanyahu, who also serves as Defense Minister, to normalize the status of the Israeli town of Ofra in Samaria, following a shooting attack next to the town Sunday night. First established in 1975, the town of Ofra currently includes some 700 homes. While most of the buildings were constructed decades ago, a Defense Ministry report revealed that some 500 of the 700 homes faced legal issues – despite backing from the state at the time of their construction.